Cars and vans will not be allowed to stop on three major routes into Liverpool city centre if plans revealed by the city council are approved. 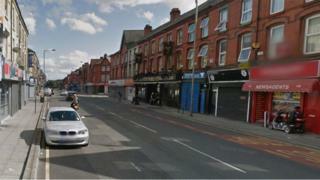 Kensington/Prescot Road, Smithdown Road and A59 County/Walton Road would become "red routes", where motorists stopping on double red lines could be fined. Such routes are used in London and the West Midlands, and are soon to become operational in Reading. The council said the measures will tackle "pinch points" and "snarl-ups". The proposals could see drivers stopping or waiting on the routes, even briefly to load or unload, face a fixed penalty notice. Deputy Mayor Ann O'Byrne said inconsiderate and illegal parking on the roads had led to "inconvenience, congestion, delays and increases pollution". "We have to make sure road users can get across the city as quickly and easily as possible [as] delays to journeys cost businesses and commuters both time and money," she added. The council's cabinet will be asked to approve a consultation and feasibility study on 15 December.